If a match does not start then generally all bets are void, but some bookmakers invoke what is known as the 72-hour rule. This basically means that if the match does not start or is not finished within three days of the scheduled start date, all bets are void except for those on markets which have already been unconditionally determined (e.g. first scorer market if a goal was scored before the abandonment). This means your stake could be tied-up for a total of 72-hours before being released back into your account. Operates in the same fashion as the 72-hour rule. This rule states that all markets will be settled based on the result when the game ends. This is understandable because if friendly matches are abandoned they are rarely, if ever, replayed. This is a strange one to get your head around but effectively all full-time result and double chance bets (i.e. 1X, 2X or 12 wagers), both pre-game and in-play, are settled on the same basis as some bookies settle friendly matches. In other words, they are settled on the score at the time of abandonment. Other bets not yet determined are void. 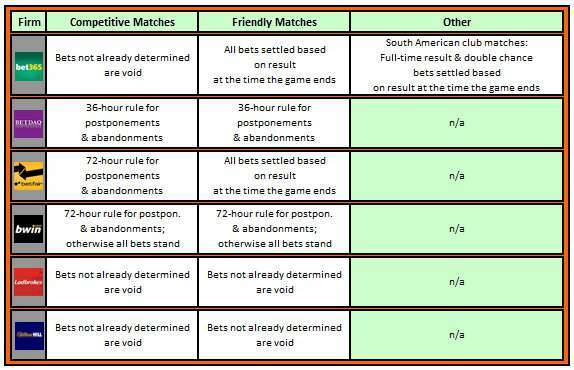 This rule has a variety of ‘subtleties’ with different firms but basically if a match starts but is later abandoned then all in-play bets which are not yet determined are void. Some bookies state that all bets will stand (if the match is replayed with the 36 or 72 hours), or sometimes all bets are voided if the match is restarted from the beginning. In some cases, if the match is restarted from the beginning then all bets matched before the market went in-play may stand, but any bets placed in-play will be void, except for any bets placed in-play on markets which have been unconditionally determined, which will stand. Got it? The bottom line is that arbitrage strategies could well be scuppered if at the time of abandonment the result is locking in a loss, with perhaps one stake being returned and the other being forfeited. Such a match will be settled by some bookmakers based on the score at the time of abandonment (especially so with friendly games) and some will void all bets on matches not completed after they have commenced. The Granada v Mallorca match turned out okay and it was just a case of missed profit as our stake was returned to us 36 hours later. Immediately after the date fixed to play the remainder of the match was made public; the last 30 minutes were played on 7.12.2011, with the match finishing 2-2. You have it wrong for William Hill. They pay out on the decision of the authorities, as I have found out after Besiktas were in my accumulator !! I found this a very useful article, I kind of wish I has seen it before I placed this bet. I did a fivefold accumulator, one of which was a friendly game. The other four results won, but I lost the bet based on the fact the friendly game finished on 78 minutes, and i still needed a goal, for under/over total goals bet. Now I find it wrong that the rule for friendlies can state result as and when the ref blows the whistle. I took odds at the start for three goals in 90 minutes…those odds reflected ninety minutes. I actually only got 78 minutes. Now how is that fair on the punter? I mean what if the ref blew up after 1 minute? I still lose. That means the ref is basically on the bookies side, it cant be right. I actually think that condition should not be legal, based on the fact the odds at the start are based on ninety minutes. Therefore those odds should be void if 90 minutes does not take place. Yes I guess I am ranting, but I spend a lot of money with said bookmaker, and I find this condition very suspect.